Reposted in MJ's Memory: At first I thought my first was a cassette single of Bel Biv Devoe's Poison I bought from the Bergen Mall, but then I realized I had a record of Michael Jackson's Thriller at 5. I was only a little bit older than when I confused my father's records for frisbees that would shatter when they hit the fireplace's brick mantle. Soon after, I got my own Fisher Price record player—since I was not allowed to play with daddy's anymore— with an indestructible needle that would always collect lots of dust bunnies before I had to clean it up. It had a cover with a handle on it, making it portable. For some reason, it was brown. I'd played plenty of Disney records on it, like disco duck, but Thriller was my first piece of pop chart Americana. The album cover folded out and showed MJ coddling a baby tiger, and the songs were written in a pink-red cursive on the back. Epic was the record label, if I recall. 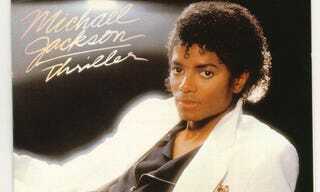 I'd listen to it over and over again, but saved the Thriller for when my brother Jonathan was around. We'd queue up the song, and quickly dart under a blanket, to protect us from the zombies we'd seen on MTV. We were genuinely scared of that song, even more scared then when that dude would pull the heart out of that guy's chest in Temple of Doom a few years later at my first movie. When actor Vincent Price's voice came on with the monologue, it was fun to tear the blanket off my brother, tucking it under my sides as he tried to get back inside before the imaginary undead cracked his bones in his teeth and drank his marrow. I laughed in accord with Vincent Price's cackling, little brother Jonathan, squealing, making an easy sacrifice to the lords of the dark. Billie Jean was an early education that women would sometimes claim you were their children's father. And that sidewalks could be backlit. And Beat It was the other song that was musically gripping but also fashionably inspirational. Then, and in more recent decades. It's just a shame the jacket's zipper pockets were totally just zippers, no pockets. Except one or two which were a mistake to put things in, because you'd lose stuff in the sea of XYZ. Listening Test: It's music tech week at Gizmodo.